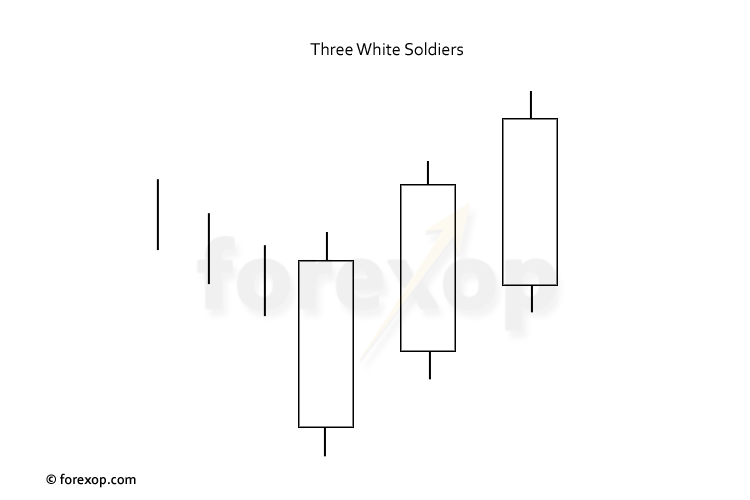 Three white soldiers is a candlestick chart pattern that’s normally associated with a bullish reversal of a trend. It can appear at either minor or major trend reversal points. It’s made up of three white (bullish) candlesticks lined in a row with each closing higher than the last. The pattern can appear either in downtrend or a downward swing in an uptrend. Both of these configurations are common in forex charts. The first candlestick in a 3-white-soldiers chart should make a new recent low or be close to a new recent low in the trend. The following two bars should open at or higher than the last one. Each bar must also close higher than the previous one. Each candle should have a short upper shadow which suggests that buying held strong until the close. The key point is that the arrangement forms at a chart low and then makes successively higher highs with three strong, bullish candlesticks. The name comes from the uniform appearance of the three white bars. It is the bullish opposite to a “three black crows“. With all technical patterns there needs to be some interpretation of the chart since cases are seldom clear cut. The three-white-soldiers pattern is no different. 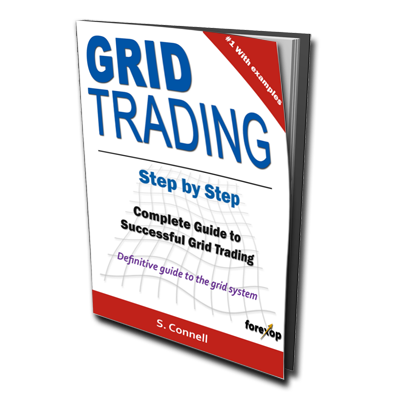 When trading for profit we have to examine the chart for evidence of buying and selling pressure and what the potential is for a reversal at that point in time. This formation is most likely to appear where the market is reversing after a brief downswing. It can appear in major trend bottoms but since there are far fewer of those in any chart, the number of appearances overall is less. If the pattern does appear in a significant downtrend it’s risky to enter the market long at that point. At least it’s risky based on this one indication alone. There can be a high percentage of false positives so we have to manage those situations carefully. The chart in Figure 2 is of USDJPY and we can see the first pattern emerges during the long downtrend. But in hindsight it is a false signal. Following on from this the market goes on to fall further before the trend eventually bottoms out. The failed pattern is relatively weak, based on its size and we don’t see any other strong evidence that the trend could be turning bullish at this time. We then see a strong bullish engulfing candlestick. This gives a sign that the market could be getting oversold and is building towards an upswing. 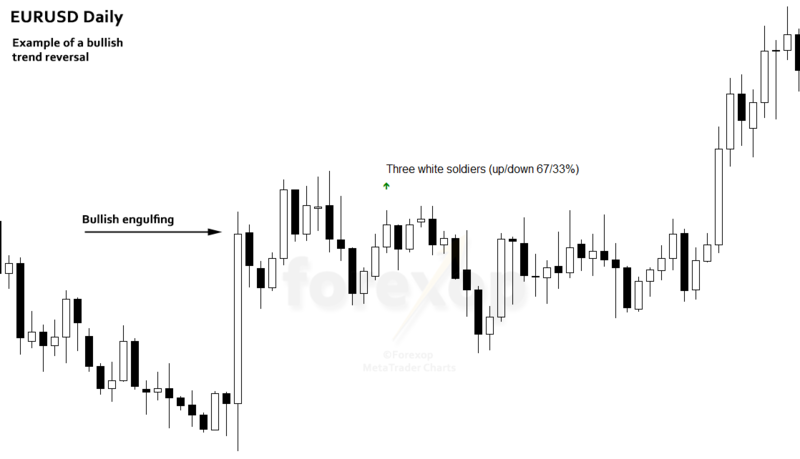 The trend does in fact form a low shortly afterwards and we then see two more “3-white soldier” patterns emerging as the trend turns upwards. Trading with the trend is usually less risky than trading against it. For that reason we prefer to enter when a bullish trend is already established. The chart in Figure 3 shows the reversal of a downtrend in EURUSD. The long white candlestick is a strong bullish engulfing. This suggests a trend reversal could be building. We then see some consolidation as the market is evenly divided between buyers and sellers. 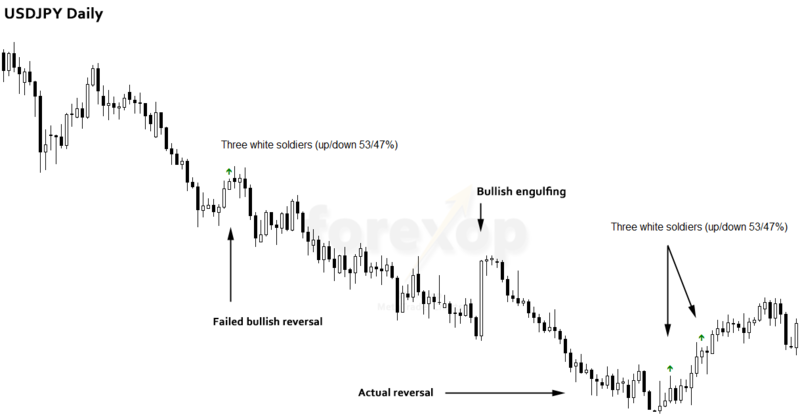 Following on the three-white-soldiers pattern appears and gives another clue that the trend is turning bullish. Next there’s some further consolidation before a new bull trend starts. The reliability of the 3-white soldiers is chart dependent and time frame dependent. We always confirm this beforehand by analyzing the history. One of the challenges with the 3-white-soldiers as with engulfings is in dealing with pullback. Pullback happens when the price moves back in the opposite direction. These can extend into bullish three line strikes, where the pullback is sudden and brief, but the trend reverses again. The pattern can sometimes be traded profitably as a contrarian entry signal as well. That involves selling or “fading” the move as a false breakout. Hi, it’s a very good pattern. It works especially well in downward trend. I’ve successfully done it for last 3 years. When a graph goes upward we don’t know how long it’ll go up. But when it goes down it keeps going down. It’s similar to double red strategy.